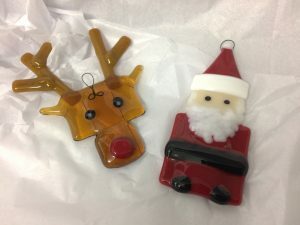 Cutting & Fusing with glass is not nearly as scary as it sounds, come and try it out for yourself. We regularly run workshops at our well equipped, cosy studio in Shropshire and supply absolutely everything you need (equipment & materials – and lunch if you stay all day) to make your own beautiful fused glass; just bring yourself (in comfy shoes). Class sizes are small and depend on the workshop, usually 3 or 4. However we can take 5 for a group of friends. Unleash your inner creative, try something new and, above all, enjoy yourself! I can be very flexible so if you and a mate or two are at a loose end and fancy some creative time together, just contact me! I can often arrange a workshop at really short notice. Normally I need 3 minimum for a half day and 2 minimum for a full day. Studio Location – all workshops, unless specified, take place at my studio. 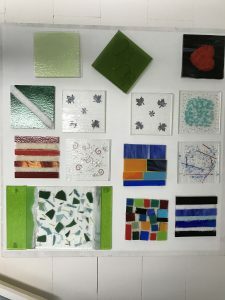 A gentle introduction to glass fusing design techniques, specifically for complete beginners. 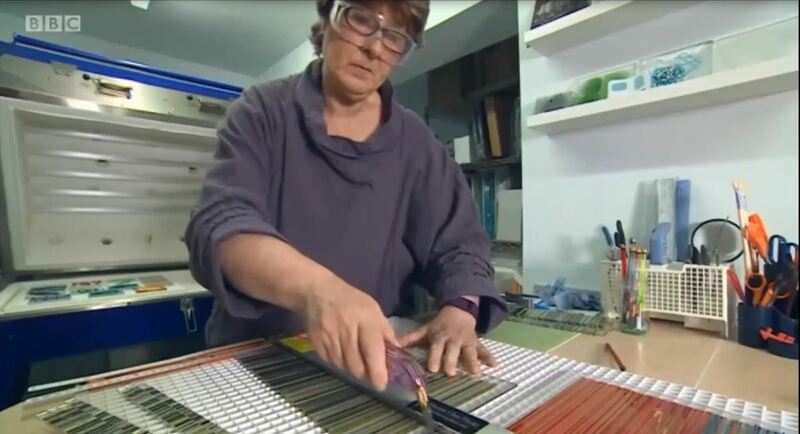 ♦ Safety in the glass studio. 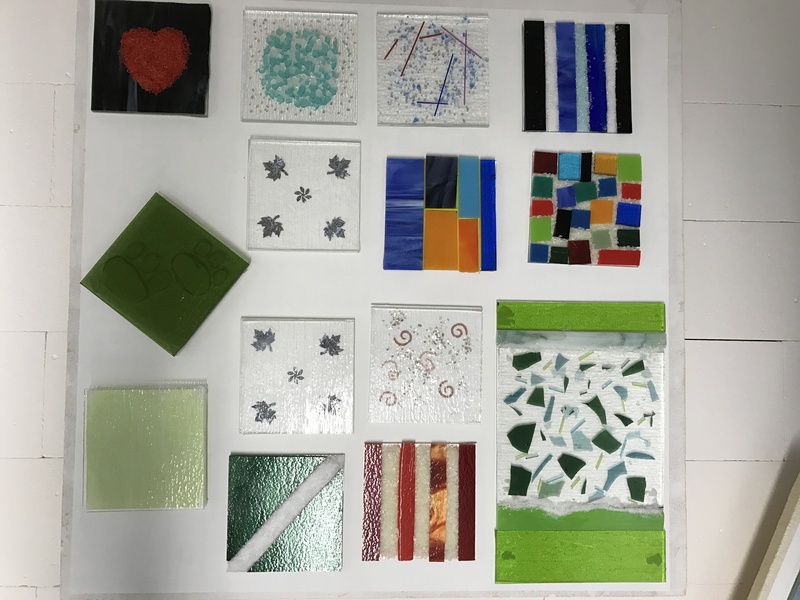 ◊ What is glass fusing? And other terms we use. 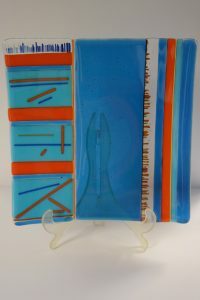 ♦ Introduction to art glass; types & compatibility and tools. ◊ Learn to cut and handle glass with confidence – yes you can! 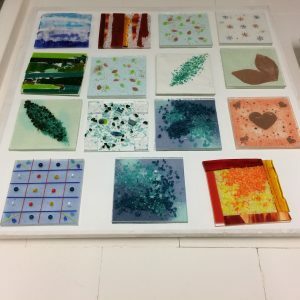 You will make approximately 4 coaster/ tile sized projects (10cm square). Two of these can be slumped into trinket dishes if you wish. Each project can be different, or you could make a set (e.g. coasters). We will discuss various techniques and I will demonstrate, guide and advise you to create your own designs. All materials; art glass sheet, accessory glass and equipment (including safety equipment) will be supplied. Refreshments are provided. Max class size 4 (unless by arrangement). 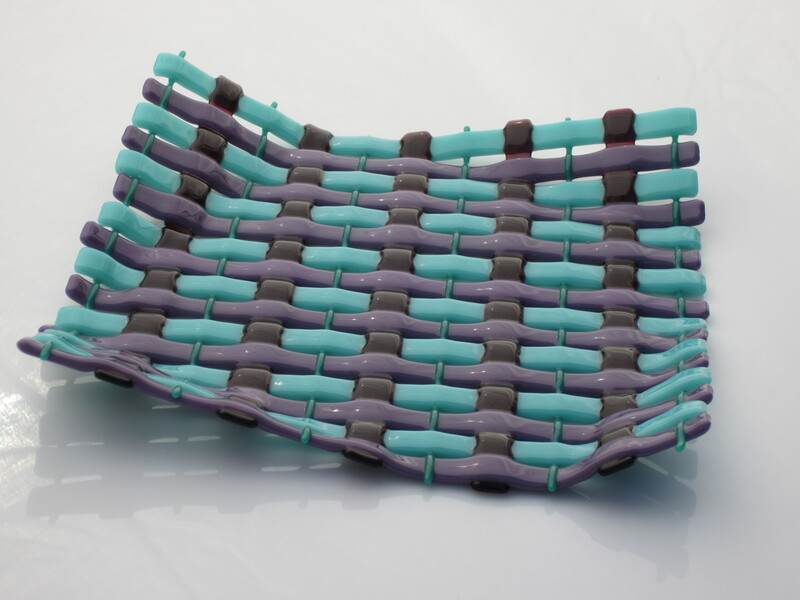 Firing; fusing & slumping (shaping), are overnight processes and will take place during the following 2 weeks. Your lovely fused glass can be collected after that. If you can’t collect I can courier via DPD at a standard fee. Suitable for beginners. Full day approx 7 hours (10am – 5pm) including a break for a light sandwich lunch, which is included in the price. The morning is structured similar to the taster session above and by lunchtime you will be ready to ‘go large’. 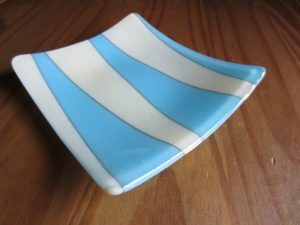 After a light sandwich lunch you’ll create your larger project which might be a large plate, a free standing curve or wave, or a shallow dish. You will be able to choose. Alternatively you can, of course, continue making small pieces. 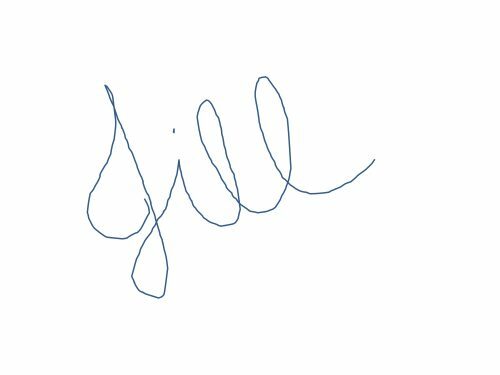 You might continue with a theme you used in the morning – or try something different. Max class size 3 (unless by arrangement). Refreshments, including light lunch provided. Firing; fusing & slumping (shaping), are overnight processes and will take place during the following 2 weeks. Your lovely fused glass can be collected after that. If you can’t collect I can courier via DPD at a flat rate..
2 or 3 hours. Suitable for beginners and intermediates. 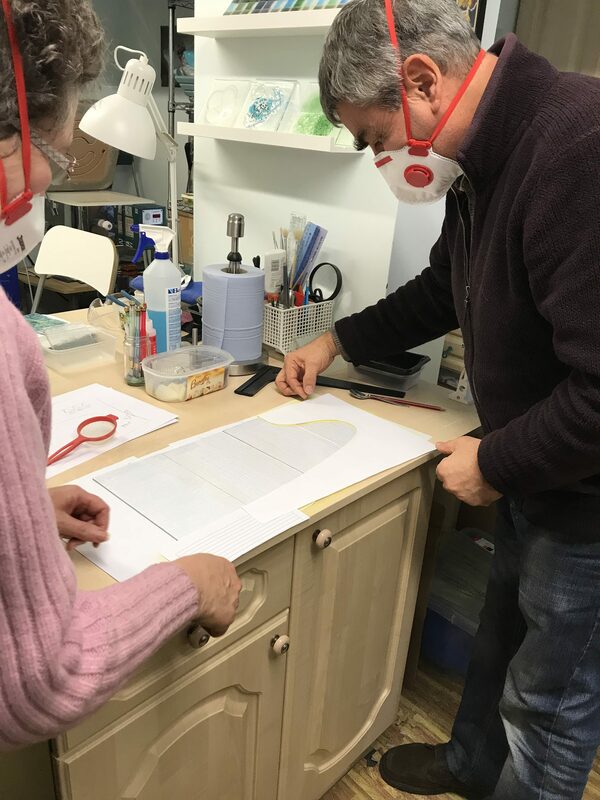 Following a brief introduction you can let your imagination go and create either a selection of small hanging decorations or a gorgeous candle shield/light catcher, depending on the workshop you choose. We have glitters and shimmers to add that true festive sparkle. Everything you need (including safety equipment) will be supplied. Refreshments provided. Max class size 3 or 4. Firing; fusing & slumping (shaping), are overnight processes and will take place during the following 2 weeks. Your lovely fused glass can be collected after that. If you can’t collect I can courier via DPD at a flat rate. Variable prices depending on workshop duration and the number of people. Share a glass fusing experience with your Valentine. A rather special and unique way to say “I love you”. The Workshop is exclusively for two and can be tailored for beginners or intermediates! Dates on and around St Valentine’s Day. Firing; fusing & slumping, are overnight processes and will take place during the following 2 weeks. Your lovely fused glass can be collected after that. If you can’t collect I can courier via DPD. Spend quality, creative time with Mum. An exclusive family workshop for Mum and up to 3 others. Suitable for beginners or intermediates, it will be tailored to suit your group. Usually runs on Mother’s Day and the preceding Saturday. 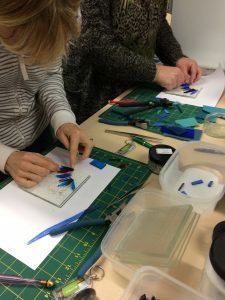 In this workshop you can develop your skills further, or learn new, and you will be working with larger sheets of glass. 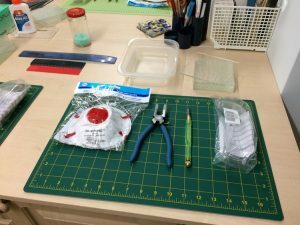 With small classes I can structure your workshop for you; so, before you come we will discuss what techniques you would like to use. Call first if you would like to talk through the options before booking. N.B. You may need to call to check the half day availability. 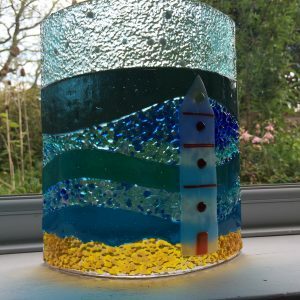 In a half day – typically one large; 30cm x 30cm or several smaller projects (you will need to be able to cut your glass). In a full day – typically two large or large & smaller projects, though you may like to spend the whole day on one detailed piece. All materials; art glass sheet, accessory glass and equipment (including safety equipment) will be supplied. Fusing & slumping your project(s) is included. Refreshments, including light lunch for a full day, are provided. Max class size 3. Firing; fusing & slumping, are overnight processes and will take place during the following 2 weeks. Your lovely fused glass can be collected after that. If you can’t collect I can courier via DPD at a flat rate. Would you like to spend 2 or more days ‘immersed’ in glass? 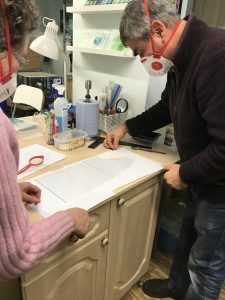 I offer bespoke workshops for 2 or 3 people, beginners or intermediates. 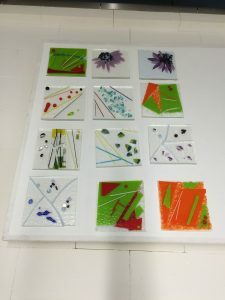 Working through specific techniques in more detail making small and large projects as we go and using the opportunity to create test/sample pieces (small tiles/coasters) before committing your ideas to a larger work. Depending on the course length you can also try out some cold working techniques, including grinding, engraving and, or sandblasting. Refreshments, including light lunch, are provided. Max class size 3 (2 for longer courses). Jewellery findings can purchased as required. Firing; fusing & slumping, are overnight processes and your final piece(s) of work may require further firing (depending on the workshop duration) which will take place during the following 2 weeks. Your lovely fused glass can be collected or couriered via DPD after that. Experimenting with reactions or lattice work. Perfect as the basis for a holiday in Shropshire: If you are visiting from further afield there are places to stay nearby from cosy & oh so convenient Bed & Breakfast right here in the village, to country inns and self catering lodges a few miles away. You could choose to take a day ‘off’ in between your days in the studio. Tour the area, shop Ludlow, eat out in Shrewsbury or take another art or craft workshop. Or just chill, take a walk and enjoy our beautiful countryside. Shropshire has a wide variety of interesting things to do from visiting the Ironbridge Gorge World Heritage site, exploring the wild Shropshire Hills area of outstanding natural beauty and our own lake district in the north – the Meres. It is steeped in history from its strategic importance in medieval times (Ludlow, Shrewsbury and Oswestry are border towns), timber framed architecture abounds and Shrewsbury is the birthplace of Charles Darwin. Not to mention being surrounded by other beautiful and interesting places – Chester, Mid Wales & Snowdonia, Herefordshire, Worcestershire and the Potteries – all in all, our little area of middle Britain has a lot to offer. ◊ Wear comfortable clothing, trousers or jeans – no turn-ups and trousers not tucked into boots – please. ♦ Wear closed, comfy shoes – definitely no sandals or open toes! This is for your safety and is not negotiable. ◊ Long hair is best tied back. ♦ All art glass materials and equipment, including safety equipment, is supplied. ◊ Tea, coffee, soft drinks always available. ♦ Worktops are high (think kitchen) and I have high stools, so you can perch or stand. NB: There are no desk height tables or chairs. ◊ Class sizes are small (2-4) which means a good student to teacher ratio. ♦ Minimum age unaccompanied by an adult is 16. ◊ A steady hand is required. ♦ Perfect for small hen party or birthday! If you have any questions at all, please do call or email first. Cancellations up to 4 weeks before the course 95% refund. Cancellations up to 1 week before the course 55% refund. Cancellations within the last week, no refund. It may be possible to rearrange your workshop at no extra cost, so please call first. If your workshop is cancelled by me due to unforeseen circumstances I’ll offer you an alternative date or a full, 100%, refund. All workshops take place at my Studio in Worthen, on the B4386 Montgomery Road about 12 miles (20-25 minutes) South West of Shrewsbury. When you book I will send you precises details to find me in the village! 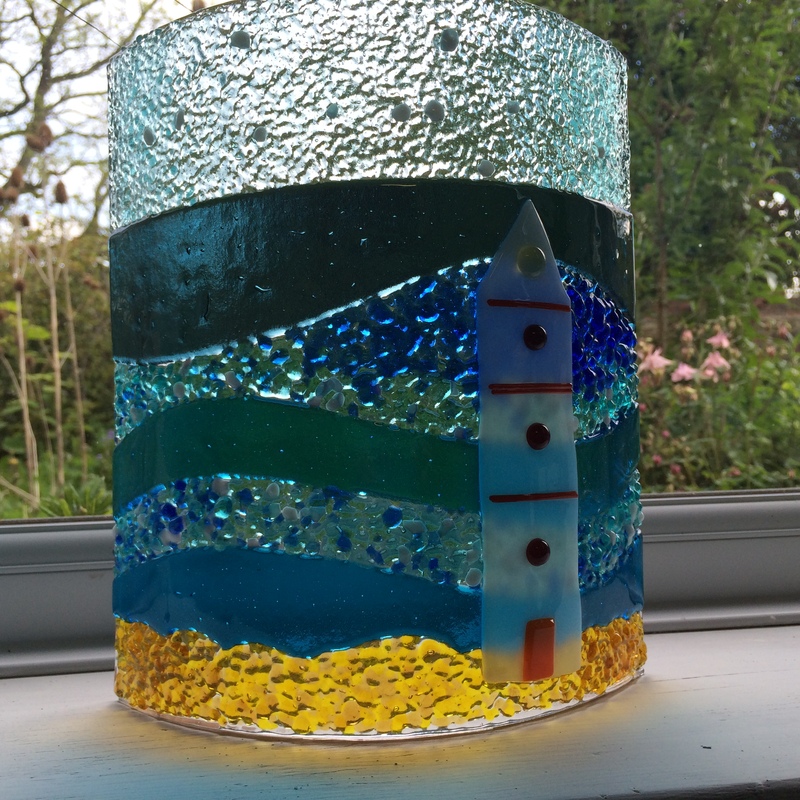 Your ‘tutor’ is glass artist Jill Bagnall, who has been running glass workshops in Shropshire for over 3 years now. Looking very serious here but that’s what happens when I concentrate! 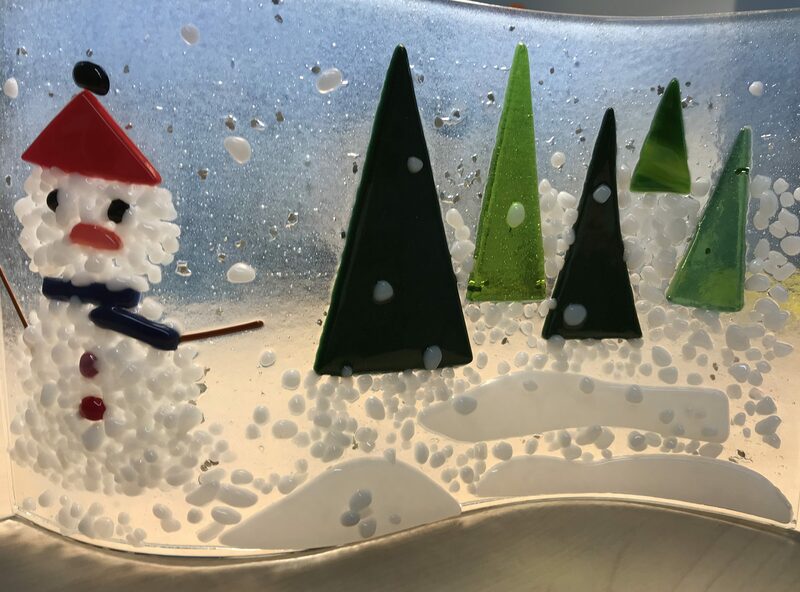 I love introducing glass to new students and am delighted when they create such beautiful items, we always enjoy ourselves and the feedback is so positive both ways. 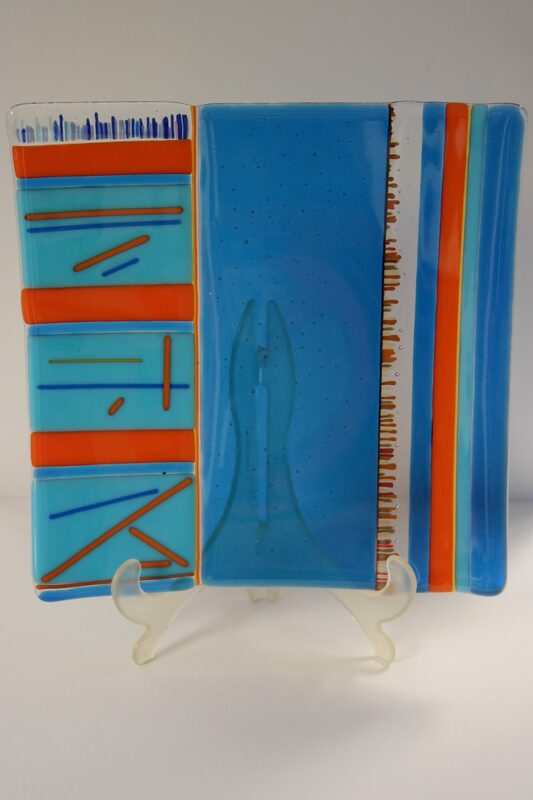 I have a good knowledge of fused glass gained over the last 12 years. And I freely admit I was originally bitten by the glass bug at a short taster workshop about 13 years ago. So don’t say I haven’t warned you – glass is seductive & addictive. I continue my own glass education by attending at least one masterclass each year, learning new techniques from internationally renowned glass artists, such as Karl Harron, Richard Parrish and Nathan Sandberg, not to mention Helga Watkins-Baker at The Glass Hub. There is also lots of experimenting and practice in my studio. All this goes into my aesthetic melting pot to create my individual art work and ultimately into the portfolio of techniques I can pass on to you. 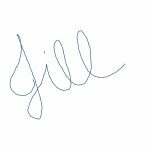 My teaching style is fairly unstructured allowing you to experiment with the techniques you are drawn to, while I’m on hand to advise, suggest and guide as much – or as little – as you, my students, require.